I FOUND JAX A FOSTER HOME!! I am so excited to share that Jax will be spending the year with my friend and co-worker Amelia and her husband, David. They are the cutest couple ever and will give him all the treats and armpit scritches he can handle until I get back. I know so many of my friends and family have been asking about who's taking him, so I thought it might be fun to do a little interview with Amelia and David so everyone can get to know them. Tell everyone a little about yourselves. What do you do for work, what do you like to do in your free time, etc.? 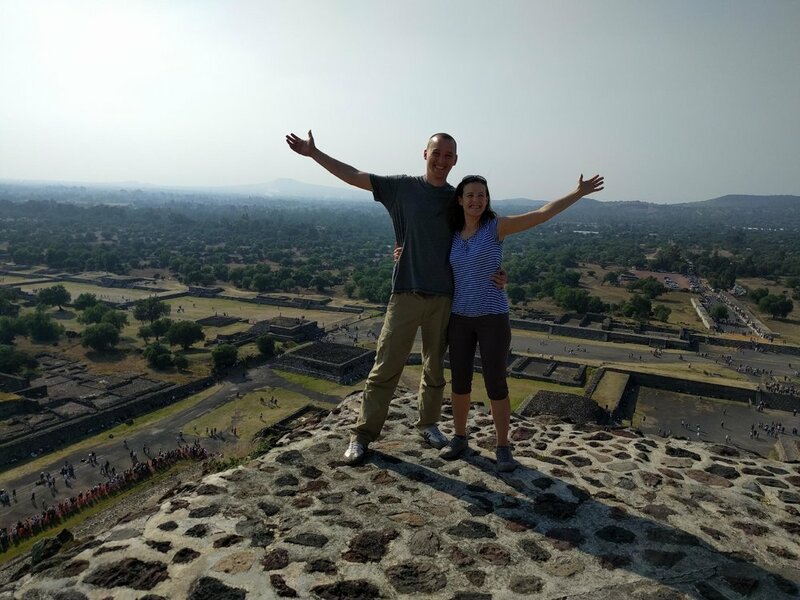 Amelia and David are quite the world travelers themselves. This was taken last year in Teotihuacan, Mexico. Amelia co-leads Moves The Needle’s social impact programs and David is a mechanical engineer at Tesla working on their charging systems. In our free time, we both love being active outside, watching movies, and checking out interesting community events. What inspired you to consider fostering a dog? Why did you ultimately decide to take Jax? We both love dogs but have not gotten one yet because we either lived in an apartment that did not allow pets or we kept moving. Now that we seem to be staying put for a bit, we thought that experimenting with taking care of someone else’s dog would help us figure out if we are ready to finally get our own. We were both intrigued by the adorable pictures you shared of Jax and how great he sounded from her description, but seeing him in person was what really sealed it. He is even more adorable in person and has such a fun personality. You’ve spent a few days with Jax already. What was your first impression? He is really friendly and has a TON of energy. During our trial days, we couldn’t believe how long he could go; there was just no way to tire him out! What most worries you about fostering Jax for a whole year? Making sure 1) we can work through his separation anxiety so he doesn’t get so upset any time either of us leaves, and 2) he is able to adjust to living in a new place for a while away from you. We both had dogs growing up and are excited to finally have a dog around again. We have big plans to take advantage of all that energy--lots of walks and hikes, playing tug of war and fetch and rope, maybe camping... we can’t wait! Which of you will be the first to fall in love with him and why? Amelia (who already has) because she got to meet him first. What do you hope for Jax a year from now? We hope he becomes well-adjusted, comfortable around other dogs, and doesn’t freak out when we leave the apartment. I am so grateful for their hospitality and I am more than confident they are going to be the best puppy parents ever! Jax loves them already and at the end of the day, that's all I need.